Discussion in 'Interactive Trading' started by ForexisLIFE, Nov 28, 2018. If Bitcoin goes under $3000 I will buy. So the system is just buy the dip? Moving to the interactive trading forum. I donno about bitcoin right now... if you believe in it, be in it, but otherwise it's pretty beat up lately. I'll be monitoring bitcoin for the next six months and then probably invest, regardless of the price at that time. As with anything, but is now a dip or is it going to fall further? Well, the issue is - where do you place a stop in a Downtrend? Firstly, she gives $ 100 to work for free and you can earn nothing by investing. And also the company guarantees payment! 2019- y'all holding bitcoin or trading on margin ? Right now I'm only holding XRP and some ETH. cool. may i ask your personal predictions of bitcoin ? If you don't mind. I know you mentioned you hold XRP and etherum, does that mean you are unlikely to invest in bitcoin this year, if so, may i ask why? I have no issue with bitcoin but as far as risk assets go I just believe I'll get a better return in other coins. 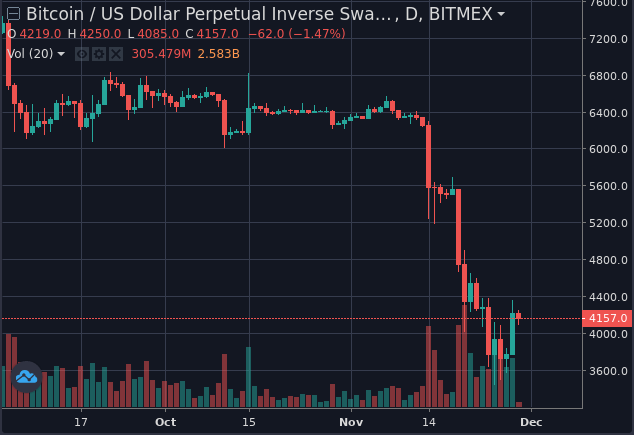 In the past you'd buy bitcoin to trade out of alt-coins.. but now there's "stable" coins that take up this role (such as TUSD, USDC, PAX, etc..) so I don't see much reason to have bitcoin exposure for now. Tomorrow it can be $0.23 .. or $7k.. there's plenty of people asking what will happen so hack journalists will push articles giving them the answer. No one knows, so just keep watching price.